When We Say Things Like 'Blow Up Detroit,' What Do We Really Mean? Another day, another disparaging comment about Detroit from someone somewhat important and another week's worth of outrage coming from Detroiters about how Detroit is Not That Bad. It's such a regular occurrence, you could set your watch to it. I’d blow up the place and start all over. No, seriously, when it takes a police officer 90 minutes to answer a call*, there’s something wrong with the system. Forty percent of the streetlights are out, most of the buildings are boarded up. Why? Inaction, that’s the problem — leadership. That skirmish aside, there's something troubling about the more recent solutions, if you can call it that, for fixing Detroit problems. I thought about it, and yeah — why do people feel so comfortable with the idea of wiping out a city comprised heavily of black citizens, with Hispanics and Asian-Americans comprising almost the rest of the percentage? 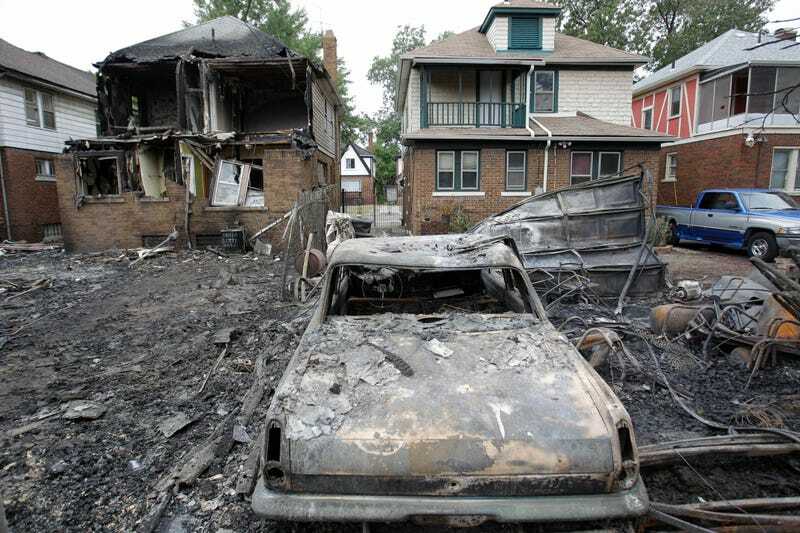 Do we want to get rid of Detroit, or get rid of the people in Detroit? Or, taking it a step further, people who look like the people in Detroit? To my knowledge, no one has suggested blowing up Stockton, another bankrupt city. But Stockton is a mix of races, too — mostly Hispanic, but near-equal parts white, black and Asian. Thinking too deep into it? Well, remember also that people have also suggested an outright purchase of Detroit, even though the city is not for sale. Again, I don't know of anyone suggesting a purchase of Stockton. But that idea that a large city (and its residents, by proxy) can simply be bought and sold with no input from its populace, its culture erased and its future defined by its new owners sounds dangerously close to more tragic chapters in American history. Postrel's logic was largely flawed, factually incorrect and debunked thoroughly, but if we look again at the demographics of Detroit, it's bold, flippant and insulting for Postrel and other coastal art critics to assume that art goes unappreciated in a mostly black city. It's why terms like "held hostage," something that easily conjures images of crime, are used, right? Not too long ago, residents had to fight back against the "blank canvas" meme pushed by newer residents who saw Detroit as an empty landscape to basically run free and redefine the city as a whole. It was Colonialism, the Sequel — completely ignoring everyone else that lived here and taking credit for discovering what was already present. That was around the financial collapse and the automaker bankruptcies when those terms were flying wild. So now that "blank canvas" is dead, is it time to fight against the "blow Detroit up" sentiments? Maybe people are tired of fighting back against every single detrimental thing said against Detroit lately (and there has been a lot post-Chapter 9), but if there's something deeper to some of those sentiments, then why not?